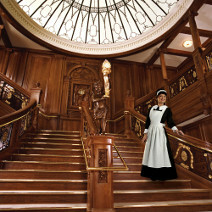 A replica of the grand staircase of the Titanic. Ziplining is a popular sport in Branson. Branson Landing is a hot spot of restaurants and shops on the lake. The land is covered in the colors of fire with browns, reds, yellows and burgundies blazing as the twinkling perky lights of Christmas peek out through the Ozark hills around Branson, Mo. Fall is just giving way to the bare trees of winter in this hilly country, and for many Oklahomans, Branson – the Show Capital of the World and home to the acclaimed Silver Dollar City – is a destination for Christmas and winter visits. In fact, according to the Branson Visitors and Convention Center, more than 1 million Oklahomans travel to explore Branson’s attractions and mountains, and Christmas in the Ozarks presents a perfect time to see the attractions, shows, new places and surprisingly hip culture of the Midwest’s tourist town. Long thought of as the “blue-haired bus tour geriatric Vegas of the Midwest,” Branson is instead a thriving hub of activities that appeal to both the young and old alike. From hundreds of world-famous shows to attend to outdoor adventure on Table Rock Lake or in the numerous state parks surrounding the city to the family activities of racetracks, laser tag and zip lining, Christmas in Branson is teeming with choices that can leave the head spinning. This year is the 24th season for an Ozark Mountain Christmas with Branson becoming a Christmas wonderland featuring Christmas shows, stunning lighting displays and once-a-year events. All aglow for the holidays, Branson becomes covered in dazzling light displays for the Branson Area Festival of Lights. Set in the backdrop of the breathtaking Ozark Mountains, the city features several light displays, including the Festival of Lights Drive-Through. Driving along a one-mile path, visitors can view more than 175 lighted holiday displays. Throughout the city of Branson and in Branson’s historic downtown area, light displays illuminate the streets and lamps to bring a glowing spectacle of views. The Branson Landing shopping and destination area also features a water and fire display show set along the waterfront to the favorite songs of the holiday season. Branson is home to three outlet malls and more than 200 name-brand shops. Sprinkled throughout the city, specialty and boutique stores offer hand-made one-of-a-kind items and dining ranges from burger shacks to upscale restaurant experiences. Branson’s newest shopping center is the Branson Landing waterfront, located off of the historic downtown area. Running along the shores of Lake Taneycomo, Branson Landing is home to more than 100 boutique stores and restaurants including Bass Pro Shops, Belk Department Store, White House Black Market and more. Nestled in the Ozark country, Christmas visitors to Branson have adventure waiting that ranges from pleasant day hikes to wild ziplining and helicopter tours. For a unique and thrilling view of the Ozark Mountains, book a zipline canopy tour with Branson Zipline, a 2.5 hour adventure that has thrill-seekers navigating ziplines, walkways, platforms and hanging bridges. Ecological and sustainable, the ziplines feature interactive guides, a hiking trail and a 100-foot freefall drop for the truly brave. Visit www.bransonzipline.com. Just north of Branson is Busiek State Forest and Wildlife Area, which offers up mixed use trails for hikers, mountain bikes and equestrians alike. Comprised of a 10-mile trail system on the east side and an eight-mile system on the west side, the trails are clearly marked and allow overnight camping as well. The red trail on the park’s east side is perfect for an easy hike, but for the more adventurous, the yellow and gray trails test stamina and courage with four and six-mile treks up and down mountainsides through wild and protected forest land. Be sure to look for the Carter Cemetery, established in the 1800s, along the red trail for a rare and unusual off-path excursion. Take a bird’s eye view of the Christmas lights and dramatic landscape in a helicopter tour with Branson Helicopter Tours. Flying hundreds of feet above Branson, Table Rock Lake and Branson Landing in an R44 Raven II helicopter, visitors can view the world for as little as $30. The company is still working on its website, but tours can be booked at the center, located right next to the Titanic Museum on the main drag of Branson. There is a reason Branson is called the Show Capital of the World. This Christmas, however, don’t miss the overwhelming and magnificent production of “Joseph” at the famous Sight and Sound Theater in Branson. Closing Dec. 29, this huge stage musical of the classic story of Joseph in the Bible features not only one of the world’s largest stages, but live animals on set and award-winning set design. A cast of 45, “Joseph” includes an Egyptian palace scene more than 300 feet big that wraps around both sides of the audience as well. Most of the established theaters in Branson have holiday-theme shows during the Christmas season, but an interactive, walk-through of The Titanic Museum Attraction is not to be missed. With some of the rarest artifacts from the infamous doomed ship to a detailed history of its creation and its passengers, The Titanic Museum Attraction is a two-deck replica of the ship featuring galleries and history. During the Christmas season, the museum will bring an enchanted forest to life featuring a Fantasy Princess that greets children. The annual Titanic Christmas Winter Wonderland includes thousands of Christmas lights, Victorian and Edwardian decorations and gift shop and costumed staff. Named one of the World’s Top Holiday Destinations by CNN.com and one of the Top 5 Holiday Events in the Country by Good Morning America, an Old Time Christmas in Silver Dollar City is a must-visit place in Branson this December. This year, Silver Dollar City debuts its new musical, “It’s a Wonderful Life,” an original adaptation just for Silver Dollar City. Through Dec. 30, visitors can attend the Frank Capra classic on the stage for a show that runs about an hour with special effects and a cast of 14 singers and actors. The second new production at Silver Dollar City’s Christmas season is the Broadway-style production of Dickens “Christmas Carol,” another musical adaptation of a holiday favorite. Complete with pyrotechnics, a live band, flying spirits and a cast of 15, this musical also runs about an hour. Each night during the season, Silver Dollar City’s streets transform into an 1880’s Christmas with the wooded streets lined with 1,000 decorated Christmas trees, a Holiday Light Parade each night and holiday foods. The Christmas on Main Street light and sound show features a 50-story LED Christmas tree synchronized to music with up to 100 light display changes per second. Keeping with Silver Dollar City’s commitment to crafts and arts, working and master craftsmen create holiday gifts ranging from pottery and cinnamon candles to blown-glass decorations and carved angels. The park’s Midwest Living Culinary and Craft School also offers daily classes on holiday specialties, taught by master chef Debbie Dance Uhrig, who is featured monthly in Midwest Living Magazine. Hours are 1 to 9 p.m. during the Christmas season, with extended hours on Saturdays. Visit www.silverdollarcity.com. Also hosted is the Showboat Branson Belle, a larger-than-life working showboat and dinner show on the waters of Table Rock Lake. With a fully catered dinner, enjoy the stage show Made In The USA!” amix of Christmas carols, holiday songs and a patriotic finale. Visit www.showboatbransonbelle.com.